Wow, thank you all SO MUCH for the Ivy love this past week! For purchasing, for the amazing comments and emails, the convo's and the likes. I'm so so happy you like it and I can't wait to see more of them popping up around the internets. 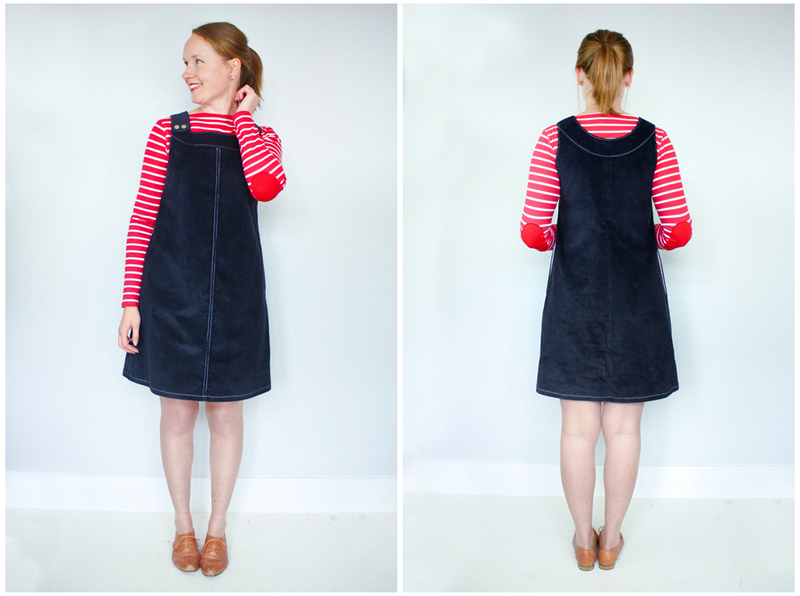 Today I wanted to show you one of the wearable muslins I made for View 2 of the Ivy pinafore. I actually have a podcast coming where you can see this exact outfit in action (because when an outfit works, it is therefore allowed to be worn multiple times in one week, right...?! Actually, to be fair, these photos were taken a week and a half before I filmed the podcast, so, you know...). I make a lot of muslins when I'm drafting patterns - some wearable, some not so much. I ended up with three wearable muslins at the end of the drafting phase for View 2, the first made from a brown corduroy, the second a rosey, pink-y vintage wool and then this one. This version has the tiniest issue at the back with some excess fabric and I also ended up adjusting the darts on the bust ever so slightly on the final pattern. These adjustments are so small though, that walking down the street, I doubt anyone would notice them at all. 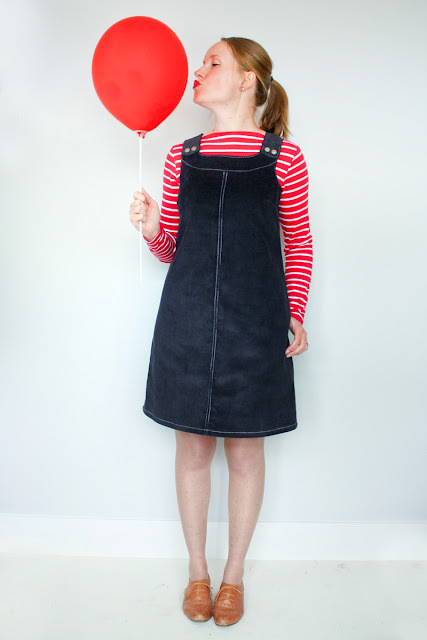 It's made in a navy pinwale corduroy (not that you'd ever guess it was navy, it looks black, even in real life!) 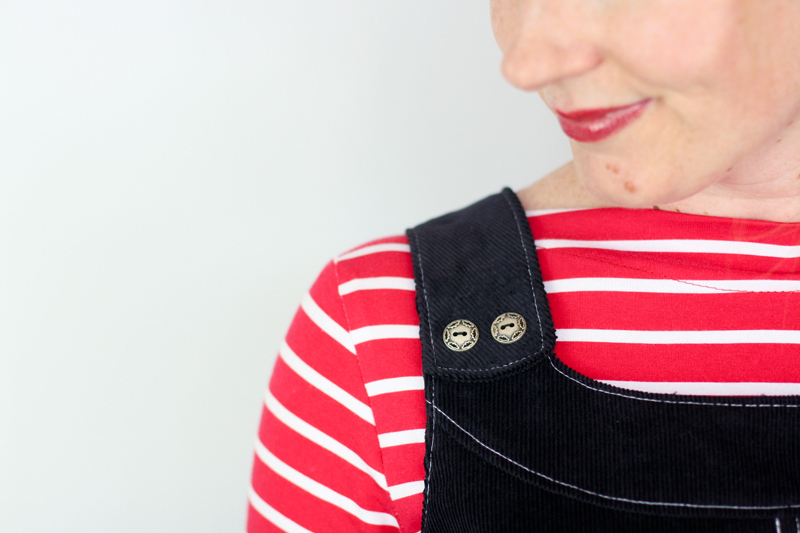 and I went for contrasting white top-stitching and some vintage metal buttons (with clouds stamped around the border! Oscar is endlessly fascinated with them). The straps are non-functional on this version, and that was mainly because I couldn't be bothered putting in button holes - the dress easily pops over your head, making it an even faster make for those of you wanting some instant gratification sewing. I'm wearing it here paired with a long sleeved Gable top made with fabric that might look familiar? 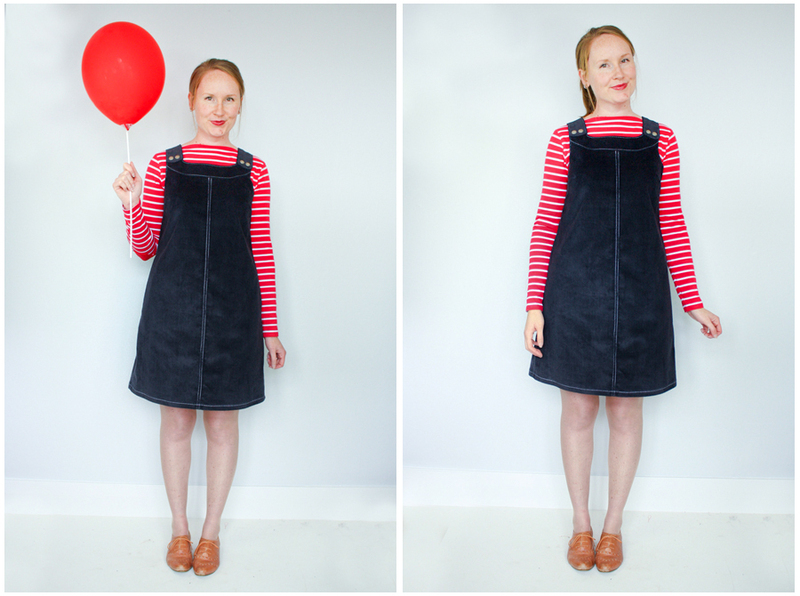 Originally, I was planning to make the long sleeved sample for Gable from this red and white striped knit, but as luck would have it, I got an end-of-bolt and therefore had enough to make a short and a long sleeved Gable! Woohoo! 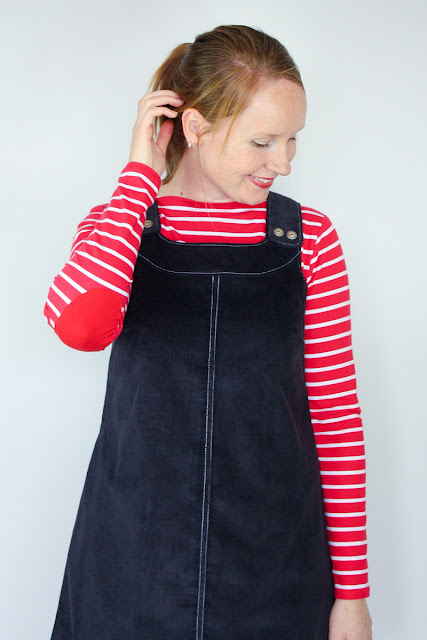 I added contrast elbow patches (made from the same fabric as my 3/4 sleeve Gable Top) and there will be a free pattern available for you first thing next week, just in case you fancy adding an elbow patch (or two - who's counting) onto your Gable top. FYI about the balloon prop. This was totally unplanned, even though I know it looks very planned. David had taken Oscar out the morning we took these photos and someone very kindly gave him this balloon. The only problem? Oscar seems to have a love/hate relationship with balloons. He loves them, wants to pick them all up and hug them AND THEN bursts into tears when holding them. Real, achy, puddles-of-tears-hide-the-balloon-quick, kind of tears. We aren't sure what the exact issue is, one has never popped in front of him nor has he had a bad experience with them, but we now officially avoid balloons. Please, no balloons! When David got home, he threw the balloon into my sewing room & shut the door. Once Oscar was down for his nap, we snuck into my sewing room to take these photos and David casually mentioned I should pose with it. So I did. Couldn't resist. It was too perfect. 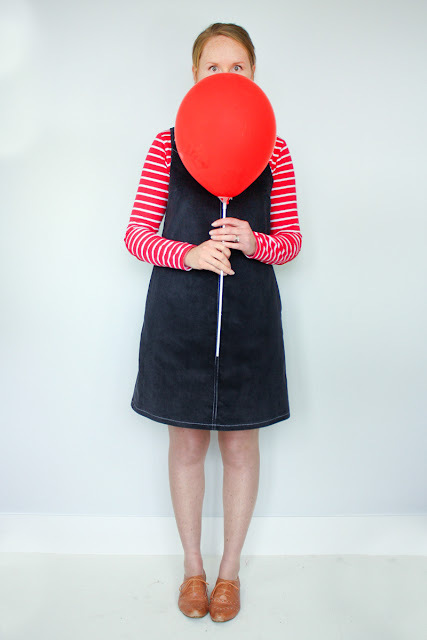 PS) Just a reminder that there's only one more week left to purchase your Ivy Pinafore and Gable Top bundle! Quick, quick!! 2 comments on "Black Ivy..."
Haha, I know right?! Bless 'em.